European Council President Donald Tusk is proposing to offer the UK a 12-month "flexible" extension to its Brexit date, according to a senior EU source. The UK's Conservatives and Labour Party are set to continue Brexit talks later. Theresa May has written to Mr Tusk with the UK's request for a further delay to Brexit until 30 June. Downing Street said "technical" talks between Labour and the Conservatives on Thursday had been "productive" and would continue on Friday. Attorney General Geoffrey Cox has told the BBC that if they fail, the delay is "likely to be a long one". On Wednesday, MPs voted - by a majority of one - in favour of a backbench bill which would force Mrs May to ask the EU for a further extension. Image caption Labour's Sir Keir Starmer told reporters: "We will be having further discussions with the government"
If they cannot, Mrs May has said a number of options would be put to MPs "to determine which course to pursue". Mr Cox told the BBC's Political Thinking podcast that particular scenario would involve accepting whatever postponement the EU offered, which was likely to be "longer than just a few weeks or months". But Conservative Brexiteer Sir Bernard Jenkin said the EU was "toying" with the UK and the PM was under no obligation to accept the terms of any extension, even if mandated to by MPs. "The government just wants cover," he told BBC Radio 4's Today. "They want an excuse to do what they are going to do anyway, which is to take us into some kind of extension. The British people don't want that." But he said an extension of a year or so would be better than leaving on the terms agreed by the PM, accusing her of being "pretty dishonest" about her willingness to countenance a no-deal exit. Europe's leaders have been split over whether, and how, to grant any extension. However, BBC Europe editor Katya Adler has been told by a senior EU official that Mr Tusk "believes he's come up with an answer", after several hours of meetings in preparation for the summit. But his proposal would have to be agreed unanimously by EU leaders next week. The prime minister wrote to Mr Tusk to request the extension ahead of Wednesday's meeting. You could almost hear the sound of collective eye-rolling across 27 European capitals after Theresa May requested a Brexit extension-time (till 30th June) that Brussels has already repeatedly rejected. Most EU leaders are leaning toward a longer Brexit delay to avoid being constantly approached by the PM for a rolling series of short extensions... with the threat of a no-deal Brexit always just around the corner. 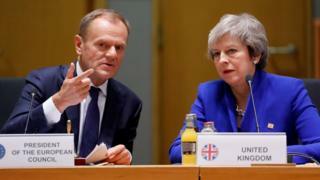 Donald Tusk, the president of the European Council, believes he has hit on a compromise solution: his "flextension", which would last a year with the UK able to walk away from it as soon as Parliament ratifies the Brexit deal. But EU leaders are not yet singing from the same hymn sheet on this. Expect closed-door political fireworks, although it's unclear whether it'll be a modest display or an all-out extravaganza - at their emergency Brexit summit next week. Under EU law, they have to hammer out a unanimous position. The EU has previously said that the UK must decide by 12 April whether it will stand candidates in May's European Parliamentary elections, or else the option of a long extension to Brexit would become impossible. Mr Corbyn has written to his MPs saying discussions included customs arrangements, single market alignment, internal security, the need for legal underpinning to any agreements and a "confirmatory" vote. Remember, behind the scenes there isn't as much difference between the two sides' versions of Brexit as the hue and cry of Parliament implies. Shadow Treasury minister Clive Lewis told the BBC the party would not be talking to the government if a "confirmatory referendum" was not an option. But 25 Labour MPs - including a number representing Leave-voting seats - have written to Mr Corbyn, saying another referendum should not be included in any compromise Brexit deal. Asked whether another referendum on any final deal was a credible option, Mr Cox said: "A good deal of persuasion might be needed to satisfy the government that a second referendum would be appropriate. But of course we will consider any suggestion that's made." Ministers have argued it could increase "the risk of an accidental no-deal" in the event the EU agreed to an extension but argued for a different date than one specified by MPs. That would mean Mrs May having to bring the issue back to the Commons on 11 April, when European leaders would have returned home, the prime minister's spokesman said. After a meeting with Irish Prime Minister Leo Varadkar in Dublin, German Chancellor Angela Merkel said her country still hoped for an "orderly Brexit". "We will do everything in order to prevent... Britain crashing out of the European Union," she said. "But we have to do this together with Britain and with their position that they will present to us." Did my MP vote to delay?